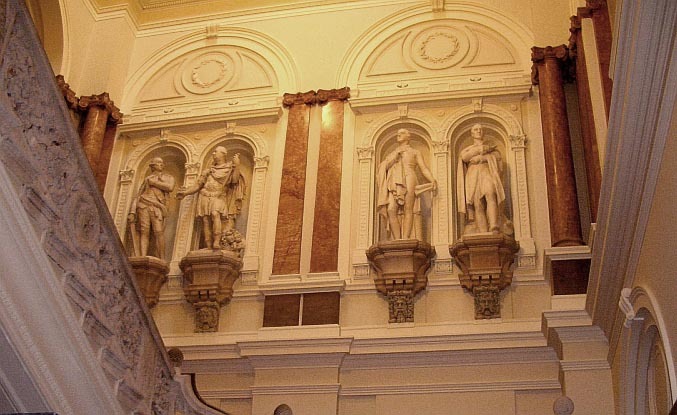 Statues above the Gurkha Stairs, Indian Office, Whitehall. Sir George Gilbert Scott and Sir Matthew Digby Wyatt. 1861-68. (another view) From left to right: Sir Eyre Coote (Thomas Banks, 1788); the Marquis Cornwallis (John Bacon, 1793), Richard, Marquis Wellesley (Henry Weekes, 1845) and the Duke of Wellington (Matthew Noble, 1855). Coote (1726-83) fought under Clive, became Commander -in-Chief of the Bengal Army, and led the army under Warren Hastings, dying out in Madras. The Marquis Cornwallis was a later Governor-General and Commander of the army in Bengal, 1786-93, defeating Tipu Sahib in Mysore at the Battle of Arikera in 1791. Marquis Wellesley (1760-1842) was the Duke of Wellington's elder brother, and Governor-General of Bengal, 1797-1805. Wellesley retaliated against Tipu Sahib "by taking control of Mysore, the Carnatic, Hyderabad, and Oudh, bringing native princes under British influence" (Cannon 667). The Duke of Wellington (1769-1852) first "established his military reputation by winning the spectacular victories of Assaye and Argaum over the Maharattas in 1803" (Cannon 667). Photograph and text 2006 by Jacqueline Banerjee. You may use this image without prior permission for any scholarly or educational purpose as long as you (1) credit the photographer and (2) link your document to this URL in a web document or cite the Victorian Web in a print one. Dixon, Roger, and Stefan Muthesius. Victorian Architecture. London: Thames and Hudsonm, 1978.pp, 160-63.